This is the complete interview by Robert Benjamin with mediation pioneer Chris Moore, Founder of CDR Associates in Boulder, CO, and a long time leader in the area of public policy mediation, filmed as part of Mediate.com's "The Mediators: Views from the Eye of the Storm" Series. Christopher Moore has worked in the field of decision making and conflict management for over twenty years and is an internationally known mediator, facilitator, dispute systems designer, trainer, and author in the field of conflict management. Moore has consulted in twenty-one countries in Asia, Western and Eastern Europe, Africa, the Middle East, and Latin America. He was trained as a mediator by the U.S. Federal Mediation and Conciliation Service (1979) and the American Arbitration Association (1976), and holds a Ph.D. in political sociology and development from Rutgers, the State University of New Jersey. 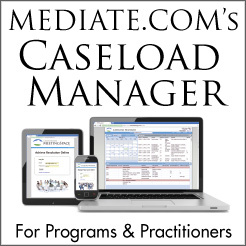 "Long before the rest of us spotted the power of the Internet, Mediate.com was there building an asset that is now central to hundreds of successful mediation practices."